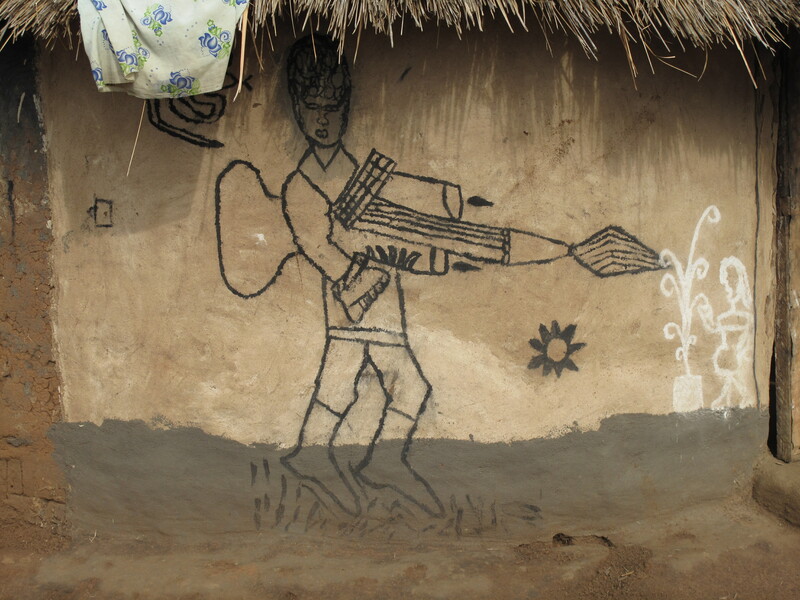 As social scientists studied communities affected by the slew of outbreaks that swept through Central Africa in the 1990s and 2000s, virologists began to wonder if the unprecedented number of cases were somehow connected. Initially they developed a theory that a single Ebola outbreak from a single index case was slowly simmering and spreading through Zaire (and then DRC), Gabon, Congo, CAR, Sudan, and Uganda. The reality that the outbreaks included several species of the virus and a multiple suspected index cases connected mostly to the handling of animal carcasses squashed the theory of a single outbreak, but still the question remained, why this sudden and prolonged string of separate and distinct outbreaks? Scientists next looked for larger environmental patterns that might connect the Central African cases. 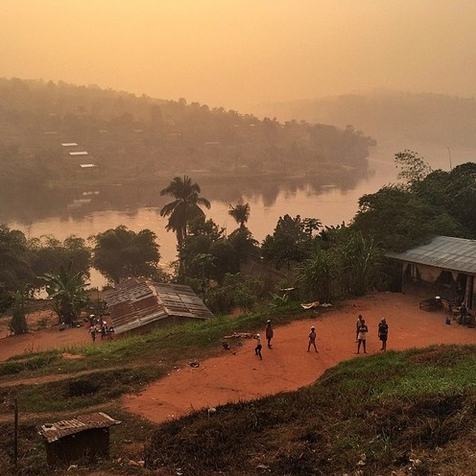 Most outbreaks of Ebola occur in between the dry and wet seasons, but there has been speculation that broader climatic event might be connected to the sustained spike in cases. The 1976 simultaneous outbreaks of separate species only a few hundred miles from each other also points to an environmental occurrence activating the virus and allowing it to jump from the reservoir to monkeys and humans. Scientists have been studying satellite photographs of the Congo Basin from the past few decades in an attempt to detect any environmental changes that overlap spatially with flare ups of Ebola. These studies have found that especially arid dry seasons disrupt the ecosystem in the jungle, leading animals to move beyond their normal confines in search of food and water, which results in increased human-animal contact. If this is accurate, global warming has serious implications for Ebola outbreaks. As promising as the research has been into detecting an environmental link, in focusing on identifying climatic trends connecting the past twenty years of outbreaks, scientists have neglected to consider the often-horrific human history of Central Africa as a potential source of explanation for the string of outbreaks. In the aftermath of the Rwandan civil war and 1994 genocide, the deadliest conflict since World War II unfolded across Central Africa, killing over four million people, displacing many millions more, and dragging in soldiers from throughout the region. The First and Second Congo Wars have not received nearly as much scholarly attention as they require, but books such as Africa’s World War written by Gerard Prunier begin to document the devastating bloodbath that occurred as troops from Rwanda and Uganda marched across lawless Zaire to evict Mobutu from his rotting seat of power in Kinshasa. Two decades later, the conflict continues to this day with fighting between Kagame’s Rwanda and rebel groups such as M23 in eastern DRC. Additionally South Sudan has suffered its own bloody history that persists despite independence from northern Sudan, and the Lord’s Resistance Army has terrorized Northern Uganda/CAR for many years, displacing numerous people. The result of the countless armed conflicts in Central Africa has been an upheaval of societies across region, causing an increased likelihood of human exposure to Ebola as starving refugees and soldiers turned to bush meat while they roamed through the Congo’s dense forests, and as they displaced animals by burning and logging forests, which may have put primates in greater contact with both humans and the reservoir. It would be interesting to see what further spatial research tracing the conflict and the virus over the past 20 years might reveal. Scientists’ omission of the deadliest conflict since WWII from their causal considerations and the dismal results of the ethics review of Ebola research (previous post) suggests a troubling trend where scientists studying Ebola in reality know very little about the region and the people affected by the virus. Derek J Taylor, et al., “Filoviruses are ancient and integrated into mammalian genomes,” BMC Evolutionary Biology, 10(2010), 1471-2148. This Nairobi matutu mapping project is one of the coolest things I’ve seen in a while. 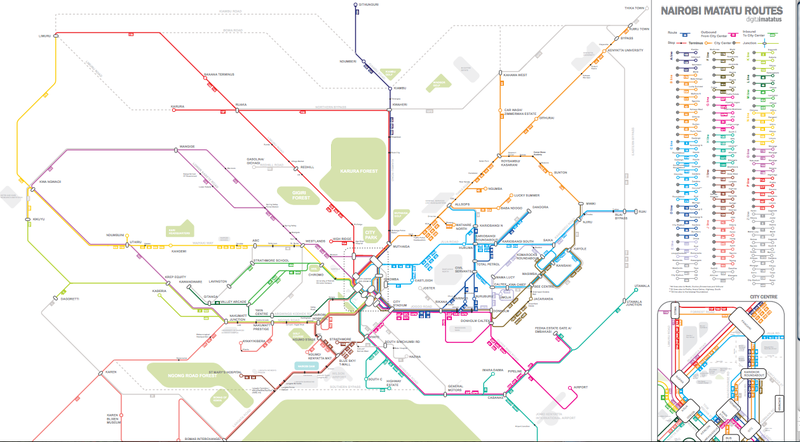 The idea is to create a map of the informal bus (known as matutus) routes in Nairobi in the aesthetic style of subway maps. Having something like this would have been extremely helping for navigating the bus systems in Kampala and Kigali. I’m the kind of person who rarely takes the bus around Boston because it’s too much of an effort to figure out the dozens of routes and the times that change depending on day of the week and time of day, so you can imagine how much fun I thought it was getting to class in Kigali or making it across town for a meeting in Kampala via bus (they’re more like oversize vans in Uganda and Rwanda) routes only found out about through word of mouth (or pointing when you don’t know the language). Of course those conversations to figure how in the world to choose which of the numerous matatus zooming by to hop into were an interesting opportunity to strike up a conversation and learn a little more about the city’s geography. And, once I knew the routes to use (distinguishing between the names of the destinations that the conductors would yell out took the most time), it felt like I had tapped into an esoteric transportation network not otherwise accessible through any kind of material map. But if I end up in Nairobi anytime soon, I know I’ll be thanking my lucky stars for this map. I’d be curious to know what Nairobians think about the project–a positive development for making the city more welcoming to new arrivals, visitors, and tourists? A lose of privileged knowledge that empowered and distinguished [poor] Nairobians from outsiders? I’d also be interested to read the history of how these routes have been slowly negotiated over the years without the oversight of government regulation. However anyone who thinks this private transportation network is an example of the efficiency of the private sector to provide what are elsewhere public services has not relied on hot, dusty, cramped, and dangerous matatus to get anywhere. But this takes nothing away from the ingenuity and creativity of the developers of these informal routes. One of the members of the team working on the project is a Cambridge, MA based company called Groupshot whose goal is to create, research, and develop “technology-driven projects that interface with and support existing local systems.” This matatu project seems like a great way to do just that. One thing to watch going forward is how current this mapping project is able to stay with the bus routes in Nairobi (how well and how long the project is maintained…) as one of the benefits of an informal, decentralized bus system like this is that it can change rapidly to adjust to new developments and flows of people in the city without having to wait for bureaucratic approvals or the redrawing of countless bus transit maps throughout the city as Boston would have to if a route was altered even the slightest. A cell phone crowd sourcing effort of the likes that the project website talks about for the future may be a solution to this upkeep problem, and something that city governments in the western world might want to pay attention to in order to keep their transportation networks agile and adaptable as changes in cities accelerate with the massive growth they’re undergoing around the globe.